US Mission China: Gong He Fat Choi! Happy Year of the Dragon! Today is the start of the year of the water dragon (23 January 2012 – 9 February 2013). Happy Year of the Dragon! 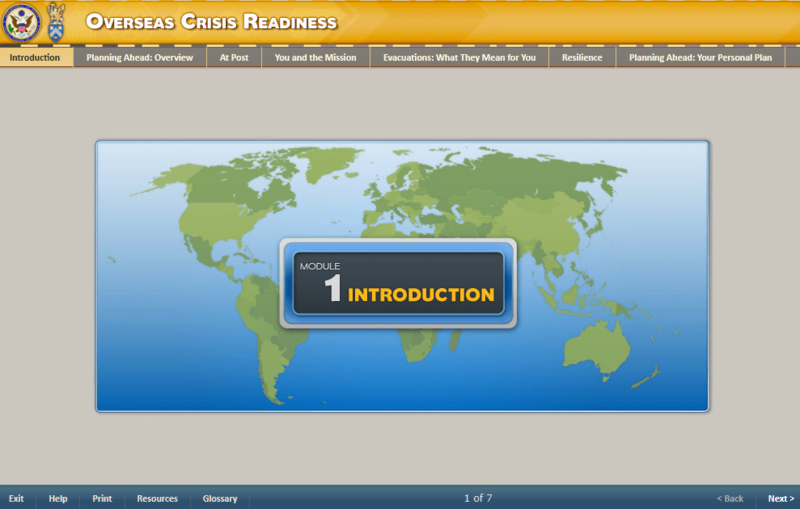 FSI’s Transition Center and the Leadership and Management School have put together this short course intended to help U.S Government families and members of household prepare for a crisis overseas. It covers preparations to be done prior to departure for post, and upon arrival at post. It also describes the responsibilities of post personnel who have roles during crisis response and have audio clips from recent evacuees. At the conclusion of the brief course, there is a useful template for creating a Personal Crisis Preparedness Plan (see pdf below). There is also an option to print out the materials. Make sure you check out the “Resources” tab at the bottom of the screen. You never know when a crisis might strike, especially overseas. Preparedness is half the battle, so check this out when you can. Via Gadling.com, another piece from David Seminara, former FSO, now photojournalist based in N. Virginia who contributes to The New York Times, The Chicago Tribune, ESPN, and other publications and sites. Once the war in Iraq broke out, I would sometimes feel a tinge of guilt over the fact that we could collect the same level of danger pay in Kosovo that our intrepid colleagues in Iraq were getting. But in the Foreign Service, compensation is often based more on the ability of an embassy’s management officers, who compile the reports that result in adjustments to things like hardship, danger and cost of living allowances. For example, when I arrived in Skopje, we were receiving hardship pay of 15% above our salaries and no one complained about this until we discovered that Sofia, our neighbor to the East, had just been bumped up to 20%. If our Munchkin’ eating colleagues in Sofia were getting 20, we thought we deserved 25. An informal task force was developed to try to document why we too deserved more money. The key was to make the place sound as dreadful as possible, and as the resident amateur photographer, I was asked to do my part by taking photos of stray dogs, litter and peeling Communist apartment blocks. The uglier, the better. A good management officer can make Paris sound like Mogadishu and thanks to the efforts of our task force, we were soon bumped up to 20%. The flip side is that some dysfunctional posts had no clue how to document hardship- real or imagined. After Skopje, I was posted to Port of Spain, which, by my account, was much more of a hardship than Skopje, but was classified as a 5% post, largely because we had Roy Austin, a political appointee and friend of George W. Bush as ambassador. Mr. Austin believed that everything was just fine in Trinidad, much to our chagrin. Port of Spain, by the way, is stuck at 5% as a hardship differential post. 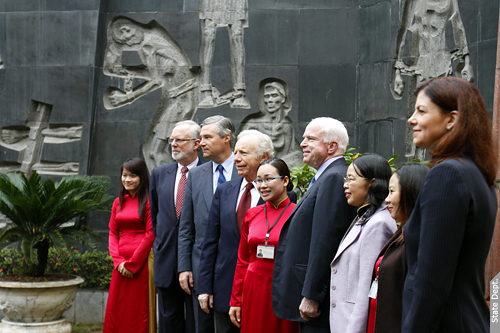 It is pure coincidence, of course, that no management officer in Port of Spain has fully completed a tour in 19 years and that our Bush ambassador there during Mr. Seminara’s time was replaced by an Obama political ambassador in 2010.
representatives of Hoa Lo Prison in Hanoi during the congressional delegation’s visit to Vietnam. 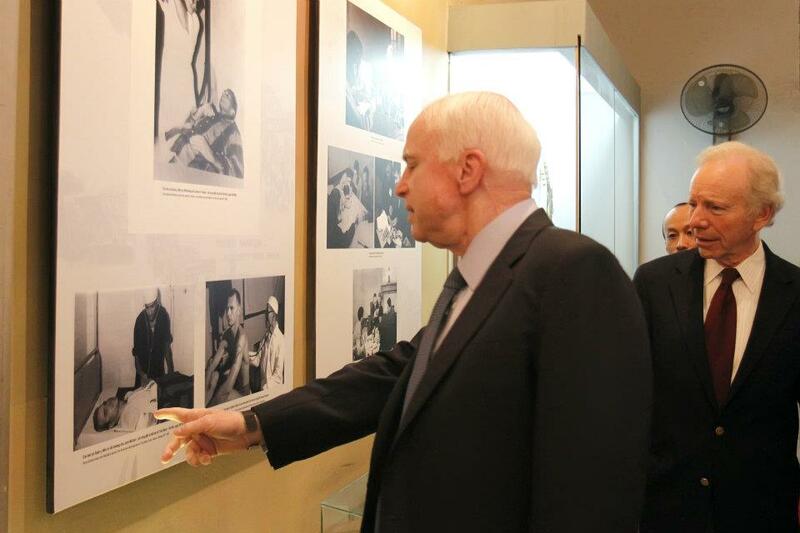 Senator McCain points at a photo taken after he was captured in 1967.
after being shot down in 1967 . 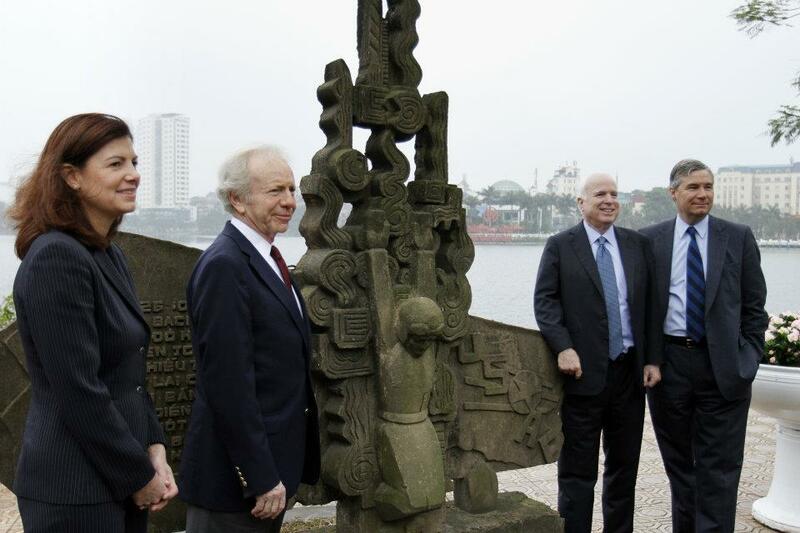 They are standing in front of the monument to his capture. 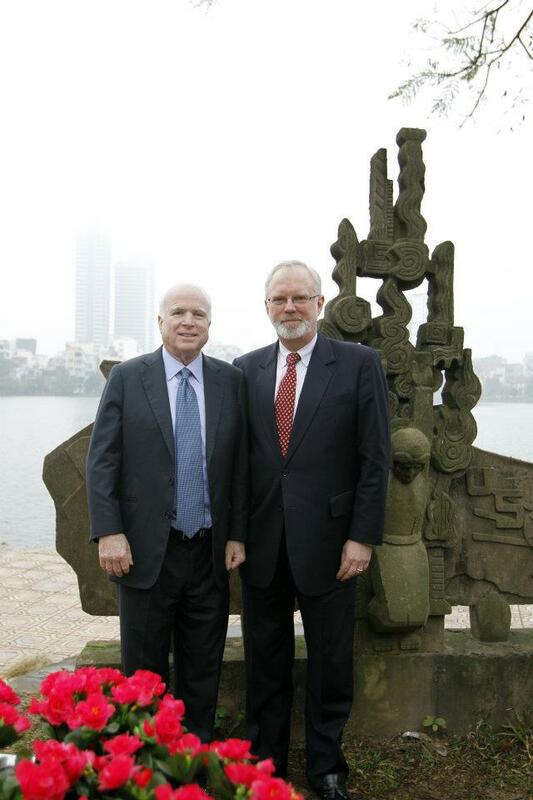 Senator McCain with Ambassador Shear at Truc Bach Lake.— in Vietnam.